When you first smell this bait, you will be surprised to find that it smells like no other bait you have ever smelled. Has a long lasting odor that attracts through both hunger and curiosity. Try a jar you will be back for more. Strong coyote scent. Sold in pints. Strong fox scent. Sold in pints. 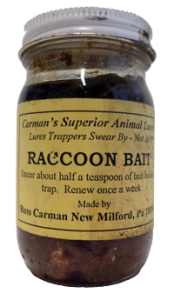 A blend of musks and oils combined with a paste base that is extremely attractive to raccoon. Excellent for coyote, fox, bobcat. Good early and mid-season. 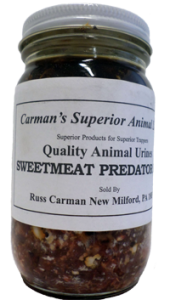 A very unique and versatile bait that is highly effective on all predators. 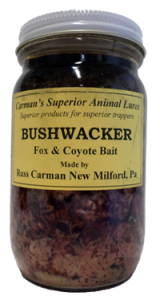 Excellent for coyote, fox, bobcat. Good early and mid-season.